An early 1960s offering from AHM was this Jumpin’ GI Jeep (No. 59361) train set. AHM’s military items are favorites with collectors and this train set provided two 50-foot heavy-duty flatcars, with three-axle Buckeye trucks, each carrying a pair of plastic U.S. Army tanks. A standard cupola steel caboose, illustrated in New Haven livery, was also part of this set, as was a circle of 18-inch radius track. The really interesting item in AHM’s Jumpin’ GI Jeep set is its power. The small two-axle side-rod diesel locomotive model was an early motive power selection that didn’t stay in AHM’s line for long. At the time this little powered Army Diesel (No. 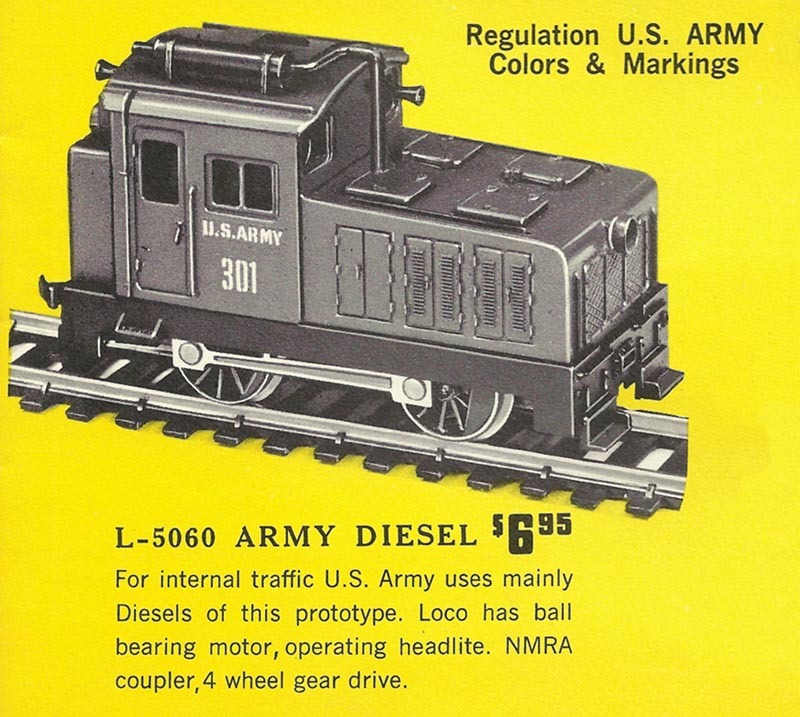 L-5060, MSRP: $6.95 in 1963) was cataloged, the Fairbanks-Morse C-Liner diesel model was announced and on its way for July 1963 delivery and the EMD BL2 diesel was due in October 1963. Those two early 1960s AHM diesels retailed for $8.95 each and came originally in powered versions. AHM’s steam locomotives in HO scale at the time included the Indiana Harbor Belt 0-8-0 with tender (MSRP: $15.95), Deluxe Dockside 0-4-0 (MSRP: $7.95), Baltimore & Ohio 0-4-0 with tender (MSRP: $12.95), and a Baldwin American 2-8-0 Consolidation (MSRP: $17.95). This set’s military-load flatcar was a 1963 release for AHM and was promoted as a Steel Fish-Belly Flatcar that retailed for $2.49 and came in three versions. You could buy this flatcar with two Sherman tanks (No. 5370), two self-propelled guns (No. 5371), or two military trucks (No. 5372). The New Haven caboose (No. 5341) in this set was one five road names available in 1963. The other AHM caboose offerings included Baltimore & Ohio (No. 5344), Pennsylvania Railroad (No. 5342), Reading (No. 5340), Santa Fe (No. 5343). The models listed are a combination of Rivarossi and Roco made efforts, imported by AHM for sale in North America.